Buy End of the Line Bankster Series Silver Rounds | ?? 1盎司2014年终版 | 银行歹徒系列银圆 The fourth and final release in the "Rise and Fall of the Banksters" mini-series captures the swan song of the bankster's heyday. Before now they were able to do whatever they liked but nothing lasts forever and people have had enough. As evidenced by the currency notes that are being ignored as they fall away, even all of their riches can't save them. Pitchforks and torches illustrate the anger of the masses towards these crooked tycoons. In "Competition is a Sin" they began to establish monopolies, the first stage of dominance in their plan. With "Spreading Debt and Death" they grew their fiendish model for enslaving people for generations and spread debt often through death and wars. With the words "Too Big to Fail" they attempted to cop out of the damage their recklessness caused the world when they inevitably went too far. And finally they have been taught the lesson they always forget, "On a long enough timeline the survival rate drops to zero." Meaning of course that no one can get away with it forever. The obverse features a design by Heidi Wastweet that shows a skeletonized tycoon facing an angry mob replete with pitchforks, torches and anger. After making people suffer through their different ideas and stages of dominance it has finally come home to roost and the people have taken matters into their hands. This tycoon has been impaled on a pitchfork and the mob's torches "light fools the way to dusty death". The bankster is encircled by the lesson he should have heeded "On a long enough timeline the survival rate drops to zero." The reverse shows the revised Silver Shield logo with the trivium in the centre encircled by the words "Silver Shield 1 Troy ounce 2014 999 Pure AG" surrounded by 47 bullets. 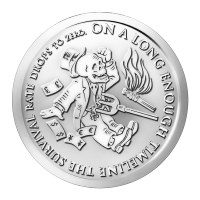 This design completes the evocative Rise and Fall of the Banksters mini-series and makes a great conversation starter or addition to any silver collection.